SEOUL, South Korea (AP) — South Korea described the breakdown of nuclear talks between President Donald Trump and North Korean leader Kim Jong Un on Thursday as unfortunate, but expressed hope that the two countries can continue an active dialogue. The collapse of the Trump-Kim summit in Vietnam is a setback for South Korean President Moon Jae-in, whose desire for closer relations between the Koreas hinges on a nuclear breakthrough between the U.S. and North Korea. Moon had planned to announce new proposals for inter-Korean engagement, possibly including economic cooperation, in a ceremony Friday marking the 100th anniversary of a 1919 uprising by Koreans against Japanese colonial rule. Moon has been held back in his drive for inter-Korean engagement by tough U.S.-led sanctions against North Korea which prohibit many kinds of economic ties. Trump told reporters in Hanoi that his summit with Kim collapsed after North Korea demanded a full removal of the sanctions in return for limited disarmament steps. Washington sees economic pressure as its main leverage with the North. North Korea's state media have yet to comment on the summit. South Korea's presidential Blue House said in a statement that it believes the U.S. and North Korea deepened their understandings of each other during their "long and deep discussions" in Hanoi. It said Trump's willingness to offer sanctions relief in exchange for broader nuclear disarmament steps by the North shows that the nuclear negotiations have entered an "elevated level." "The (South Korean) government will do all it can to ensure that the United States and North Korea can maintain momentum for dialogue while continuing their close communication and cooperation," the Blue House said. 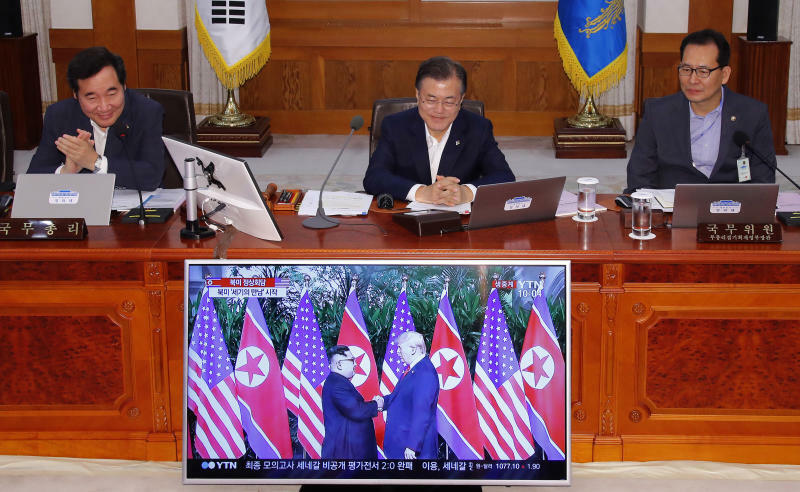 It said Moon spoke with Trump on the phone as the American leader flew out of Vietnam, and that Trump expressed a firm commitment to continue a dialogue with the North. Moon had hoped to follow the Trump-Kim meeting with his own fourth summit with Kim, preferably in South Korea's capital, Seoul. Some experts say the prospects for such a summit are now murkier after the talks fell through in Hanoi. Moon may find it difficult to sell a Seoul visit by Kim to South Koreans without tangible progress on North Korea's nuclear disarmament. Kim is also likely to be reluctant to travel to South Korea without having something big to bring home, especially after getting nothing in Vietnam, where he arrived after traveling through China on his private train for more than two days.